All the summer vibes are settling in! You know….grilling, hanging out on patios, soaking up the sunshine and the breeze. 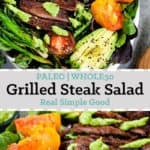 This Paleo and Whole30 grilled steak salad is full of fresh, seasonal summer produce and a tasty green dressing to drizzle over everything! 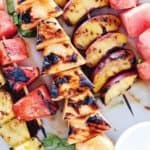 This is hands down my favorite summer meal! 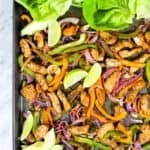 You’re going to love the simple, real food ingredients and will feel like eating Paleo and Whole30 is the most flavorful way to eat! It doesn’t get much better than the abundance of summer produce! All the best fruits and veggies readily and locally available is one of my favorite things! I can’t wait to stroll through the farmer’s market and grab whatever looks good! 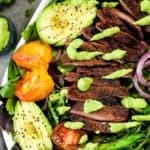 You will love the fresh veggies in this grilled steak salad, and the best part is that you can add or substitute whatever you have one hand or whatever you see at the market that speaks to you. 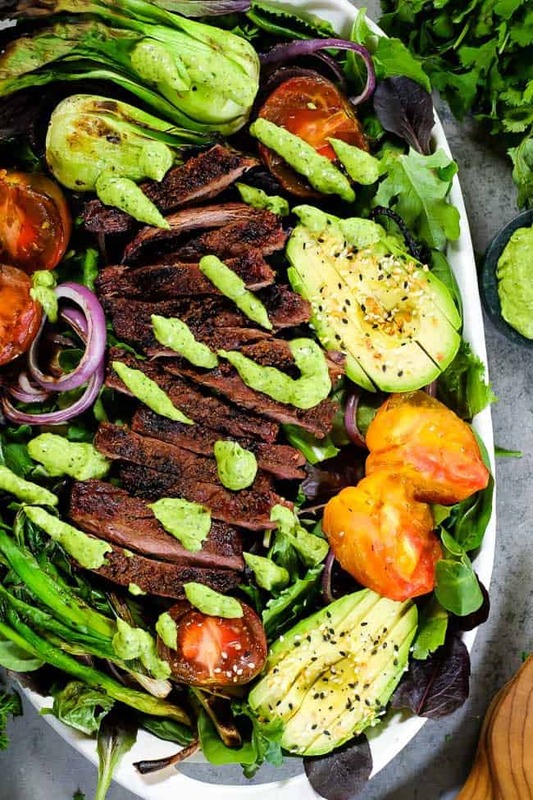 This dressing is my absolute favorite! 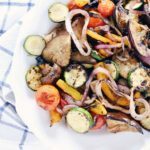 It tastes like a creamy chimichurri sauce, and you are going to love how it pairs with the seasonings on the grilled steak and with the veggies we chose. 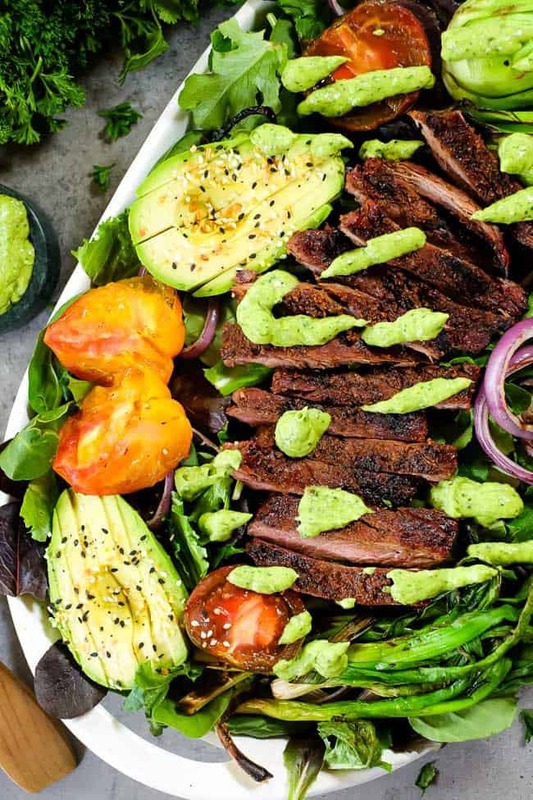 The combination of fresh herbs, garlic (this one is definitely for the garlic lovers out there), onion, seasonings and avocado is pretty magical and delicious. I crave this dressing and put the leftovers on all the bowls I make! I love it when we hit that point where it feels like we’re finally coming out of winter and the days get progressively longer. It’s the best. The evenings feel so much longer, like there’s actually extra time to relax once the day is over. You can sit down and enjoy dinner and soak up some extra rays of sunshine after work. 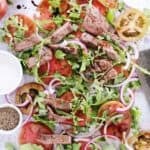 This grilled steak salad is the perfect dinner to take out on your patio with a glass of wine (if you drink) and just savor each bite while you relax and enjoy the evening. 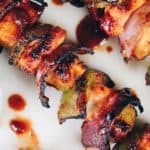 Looking for a quick and easy meal to make that feels all kinds of fancy? 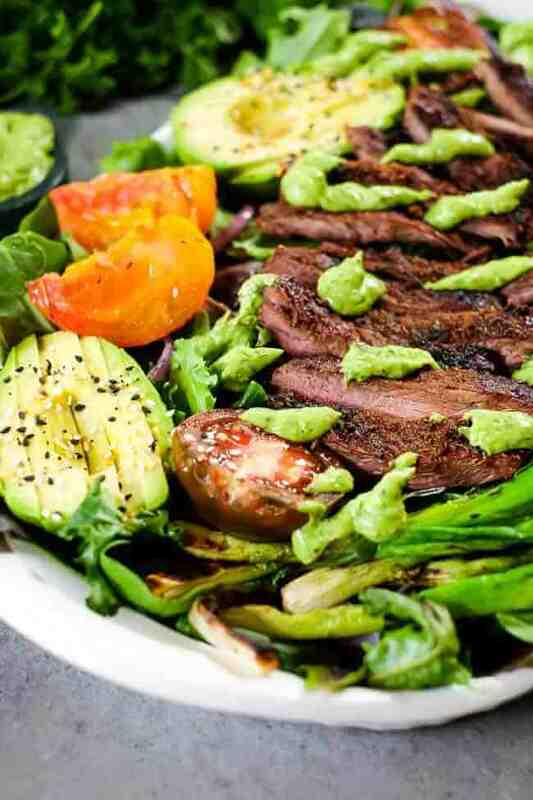 Well, go ahead and make this grilled steak salad! Slather the green dressing on and enjoy! Let us know how it goes by leaving a comment below. Also, take a photo and tag us on Instagram @realsimplegood, so we can check it out. Do you already follow us on Instagram? We hope so, but if not make sure to give us a follow so we can stay connected! All the summer vibes are settling in! You know....grilling, hanging out on patios, soaking up the sunshine and breeze. 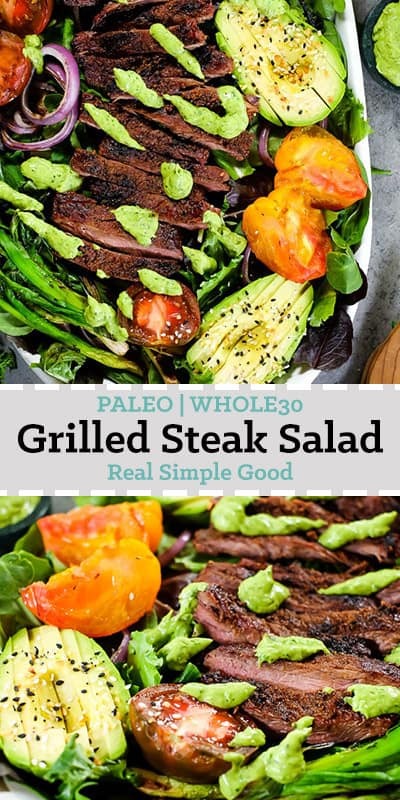 This Paleo and Whole30 grilled steak salad is full of fresh, seasonal summer produce and a tasty green dressing to drizzle over everything! Set your steak on a large plate or platter. Combine the steak seasonings together in a small bowl. Pour the seasonings all over the steak on both sides, massaging it in with your hands. Set aside. To prepare the sauce, add all of the sauce ingredients to a food processor and process to a smooth consistency. Taste and season with any additional salt and pepper as desired. If the sauce it too thick, add water, 1 tbsp at a time, and process until it reaches your desired consistency. Refrigerate while you prepare the rest of the meal. Get your grill going and chop the onion and tomatoes as noted. Once the grill is good and hot, add the steak, onions (green and red) tomatoes and bok choy to the grill. Grill for 3-4 minutes and flip everything. Grill for another 3-4 minutes, or until the steak and veggies are done to your liking. Watch the veggies carefully and flip frequently to prevent burning. The tomatoes will cook and get mushy quickly so just give them a quick sear on each side. 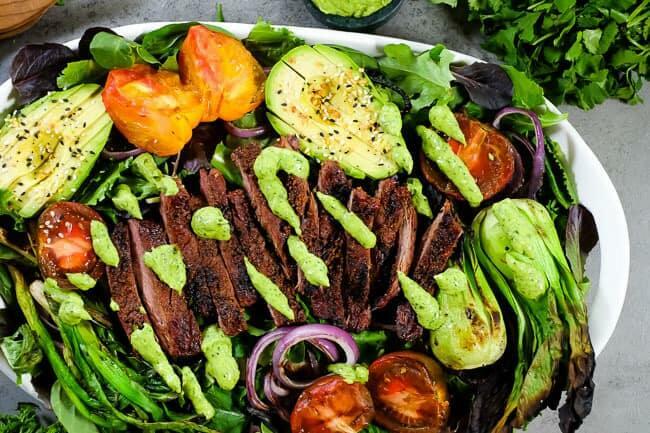 Remove and allow the steak to rest while you assemble the salad. Start with a bed of leafy greens and add on the onions, tomatoes and bok choy. Slice avocados and add them to the salad. 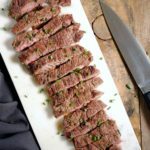 Slice the steak into strips against the grain. Add the steak on top of the salad and then drizzle the sauce over everything. Serve and enjoy. Is there a sub for the bok choy? Or can add more leafy greens?